By now we reach the time when our good old original disks reach their date of expiry and are expected to show serious physical failure. We decided to provide you an alternative way to continue playing! Below you'll find a step-by-step installation guide for each game. Big thanks to GameReplays for hosting the downloads! If you have the original BfME disk then please skip to step 3 and use your legitimate cd key. Open tBfMe.iso. This will mount the BfME disk to a virtual drive. All-in-one patch installer includes no-cd fix, widescreen fix and T3A:Online, please select these components. (If you didn't install it in step 4) Download T3A:Online to play online! This will open the folder location C:\Users\username\AppData\Roaming in the Windows Explorer app. Search for the My Battle for Middle-earth Files folder there (or create a new folder). Download Options.ini and put it in the folder. [image] Open the Options.ini file and edit Resolution = 1920 1080 to your screen resolution and save. If you have the original BfME 2 disk then please skip to step 3 and use your legitimate cd key. Open tBfMe_II.iso. This will mount the BfME 2 disk to a virtual drive. Patch 1.09 includes widescreen fix. Download T3A:Online to play online! 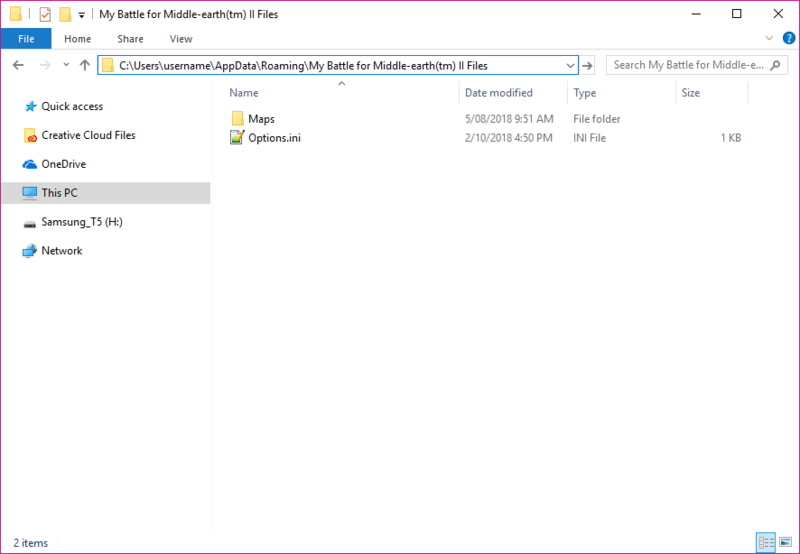 This will open the folder location C:\Users\username\AppData\Roaming in the Windows Explorer app. 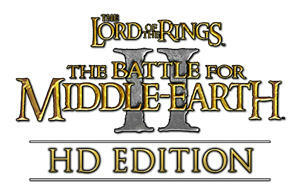 Search for the My Battle for Middle-earth II Files folder there (or create a new folder). Download Options.ini and put it in the folder. [image] Open the Options.ini file and edit Resolution = 1920 1080 to your screen resolution and save. If you have the original RotWK disk then please skip to step 3 and use your legitimate cd key. RotWK needs BfME 2 version 1.06 installed. Use the BfME 2 Patch 1.09 Switcher to change to version 1.06. Open rotwk.iso. This will mount the RotWK disk to a virtual drive. • Download the Rise of the Witch-king v2.01 Patch in your language. Patch 202 includes no-cd fix and widescreen fix. Try the Age of the Ring RotWK 2.02 mod from the HD Edition team. This will open the folder location C:\Users\username\AppData\Roaming in the Windows Explorer app. 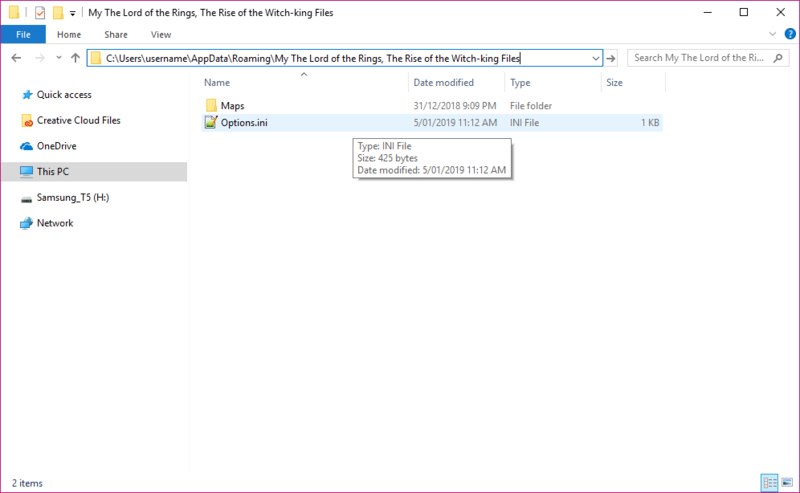 Search for the My The Lord of the Rings, The Rise of the Witch-king Files folder there (or create a new folder). Download Options.ini and put it in the folder. [image] Open the Options.ini file and edit Resolution = 1920 1080 to your screen resolution and save. T3A:Online integrates seamlessly into your BfME experience and allows you to play online. It returns the online component of all three games that uses p2p connections, allowing for stabler games and reduced lag. The HD: Editions and mods can be enjoyed without hassle. Register your Revora Account. If you already have an account on Revora Forums then log in. Create your Server Login. Warning: Your T3A:Online server login is saved in plain text. Do not re-use the password for your e-mail account, Facebook, ect. Get the latest patch. See the above guide for your game. These are the same instructions as above for changing screen resolution. This will open the folder location C:\Users\username\AppData\Roaming in the Windows Explorer app. Or create a new folder with that name. Please note that if you have installed BfME in another language then the folder name might be different. If the folder Maps is not there then make a new folder and name it Maps. The game's resolution can be edited to match your screen in the options.ini file. Game crashes before opening with no error. First, upgrade your graphics card drivers. If you have more than one graphics card in your computer then test running the game on each card. For computers with NVIDIA and Intel: The game will not open on an Intel Integrated graphics card, so use the NVIDIA graphics card. First, right click the game's shortcut. Then in the menu click Run with graphics processor and select HIgh-performance NIVIDIA processor. Also, you can open the NVIDIA settings from this menu and choose programs to use with the graphics card. While online the game says to update. Make sure you've got the original, unedited game. Downloads and guide are above. Make sure you are running everything related the game and T3A:Online as administrator. The launcher, the game shortcut, the game's exe files in the installation folder. If the above solutions don't work for you then please reinstall the game and follow the installation guide carefully. Windows 10 can mount disks to a virtual drive. 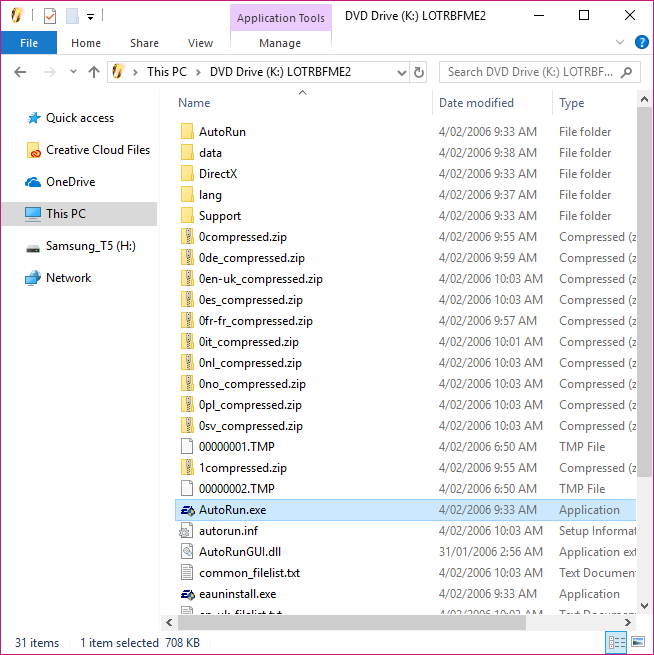 If you have Windows XP, Windows Vista, Windows 7 or Windows 8.1 then you will need a virtual drive program like Daemon Tools, WindCDEmu or Alcohol 52% to mount downloaded disks. Mini-images are used for BfME 2 v1.06 and RotWK 2.01. If you wish to play these version you will need to mount a mini-image to a virtual disk drive. Firstly, you will need one of the tools listed above (WindCDEmu, Alcohol 52% or Daemon Tools Lite) which can mount disks to a SCSI drive. Secondly you will need one of these mini-images. To play BfME 2 without a disk use this mini-image. To play RotWK without a disk use this mini-image. Alternatively, you can use an alternative game.dat file for BfME 2 which may restrict online play. The BfME 2 patch 1.09 team recommend playing BfME 2 v1.00 with the mini-image and BfME 2 v1.06 and v1.09 with the modified game.dat file. The modified game.dat file is incompatible with BfME 2 v1.00. Auto-defeat: You are defeated 3 minutes into the game. Delete the following file from the game folder. Then run or rename the following file. If you have mods that install into the game's installation folder please uninstall them and remove leftover files before reinstalling the game. Edited by MattTheLegoman, 15 April 2019 - 08:29 AM. Viewing a CD-Key attachment(s) for all BFME games requires permission from an administrator and I don't get one when I am logged in. Edited by zocom7, 10 April 2016 - 05:18 PM. Alternately, instead of using the (bugged) Daemon Tools, you can use Alcohol 52% or 120%, which I'd strongly recommend. Download and install patch 1.08 --> http://www.gamerepla...download--bt2dc"
That link takes me to BMFE1 1.05 Patch. To play without a CD, download this mini image and mount either one of them with the older version of Daemon Tools you downloaded." Doesn't work either, the guy above said the other one which needs permission. So why do you not tell people to use the Origin version of RotWK? It's free if you have a valid key and it works without a disc (or image) and also without the Origin Client running. All you need is to download through Origin and then authenticate at first start with your Origin account details. Edited by ltsheppard, 28 April 2016 - 06:32 PM. I was honestly unaware of this being a thing! We'll look into this, thanks for notifying us. EDIT: I can't find it on Origin. Help? "A few years ago the expansion pack, Rise Of The Witch King was on Origin but it looks like it's been removed from sale. I know for a fact it was on Origin because there's a copy in my library." I don't think it's up there anymore, unless you were a previous consumer? And here I was, getting all excited. Sources conflict on whether you still get it. 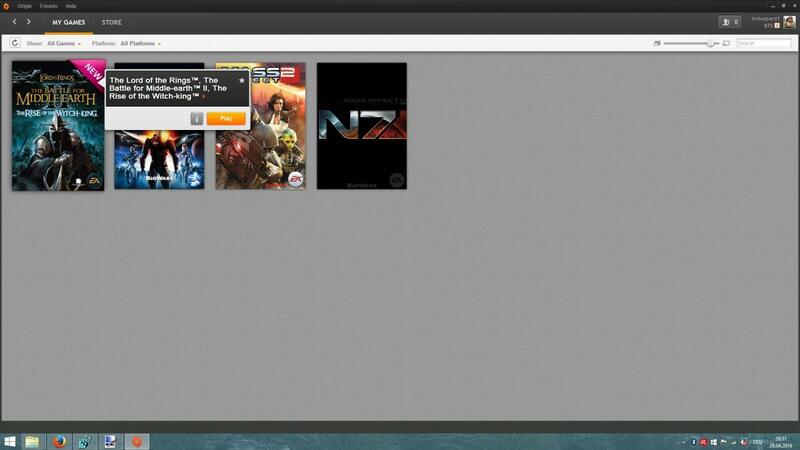 I have RotWK on Origin. I never install it there because it is pointless when you can just get it from here, no? You have to contact Origin support and give them your CD-Key. They will then add it to your library. The problem is you still need to install BFME2 from disc. I've been asking them about the basegame too but it seems there never was an Origin version of that. However, if more people would ask about it maybe they'd consider making one. I've already told them that people would be interested, maybe even for a small price. I think the reason for not showing it on Origin anymore is that, as far as I know, EA doesn't have the LotR rights anymore. However they still seem to be allowed to distribute RotWK (or else you couldn't have it in your library) in a digital format. And since WB apparently has no plans for selling BFME maybe EA can rework the series for Origin. For my part, I'd love to be able to install and play without disc or images. Well, you don't have to do the hassle of downloading a DVD image and mounting it every time you play. Also (although I'm no stickler for that) it's legal, whereas the other options are not. Edited by ltsheppard, 29 April 2016 - 10:26 AM. I think the reason for not showing it on Origin anymore is that, as far as I know, EA doesn't have the LotR rights anymore. However they still seem to be allowed to distribute RotWK (or else you couldn't have it in your library) in a digital format. They aren't allowed to distribute it. This is just residual. And since WB apparently has no plans for selling BFME maybe EA can rework the series for Origin. That's not how licensing works. You think EA had another licencse for publishing/distributing RotWK on Origin? I don't think so. It certainly applied to all the games, in every form (disc-based and digital). The problem is, while EA might be allowed to upload BFME2 to Origin, they wouldn't be allowed to charge for it without striking a deal with WB. For us players that's a real shame because the only game needing a disc/image now is BFME2. No no, I'm pretty sure this form of distribution breaks the licensing contract as well. It's convenient for those who have the key, but I'm pretty sure they're not supposed to do that. Activision refused all forms of sending replacement discs for their Star Trek games by 2008, and they were the ones who made the best use of the license between 2000 and 2003. You can't get any of them outside eBay/Amazon/torrents. I understand this, but the goal in what we are doing is to allow users to not need the CDs anyways, as we have done for BFME1. And as far as legality goes, I guarantee you that nobody cares about someone "illegally" acquiring a BFME game as they are so old now that they're considered abandonware. Edited by Kwen, 01 May 2016 - 04:20 PM.